TRUMP: No more state dinners -- we should be eating hamburgers! Joe Raedle/Getty ImagesA display of products that Republican presidential candidate Donald Trump has for guests, including meat, wine and water are prepared before a press conference at the Trump National Golf Club Jupiter. 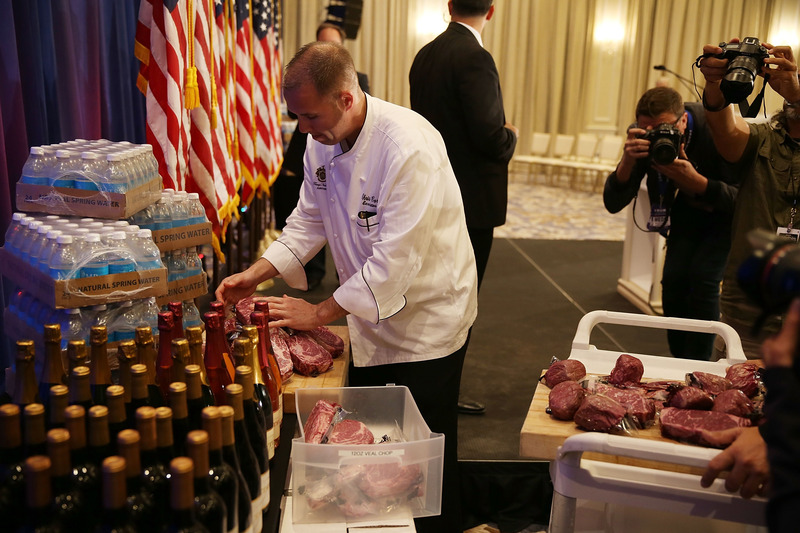 Instead, the presumptive Republican nominee said he would serve hamburgers at the White House. The comments from Trump came after he expressed willingness to host North Korean dictator Kim Jong-Un in the US. While talking about a potential visit, the New York businessman stressed he would not throw a celebratory bash for the dictator. “We shouldn’t have dinners at all!” the presumptive Republican nominee added. Trump made a similar comment last summer, saying that he would “probably” serve a “double-size Big Mac” to Chinese President Xi Jinping.